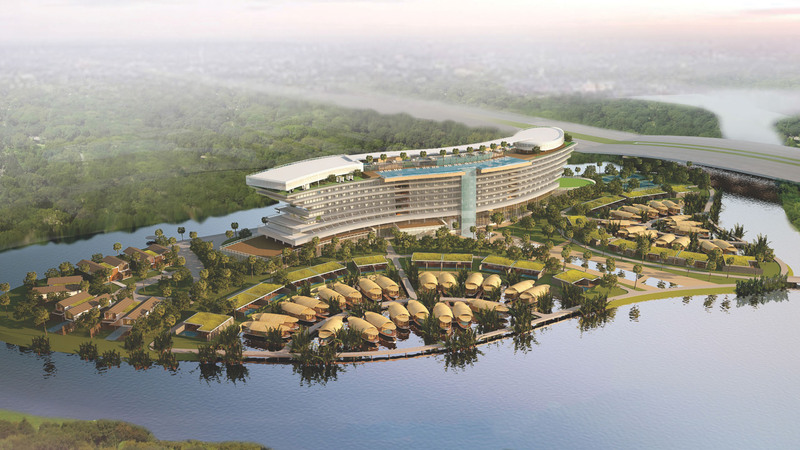 The Nypa Hotel and Resort project enjoys a favorable setting, being located on a small island in the heart of the city of Saigon, which will benefit from the upcoming construction of a Green axis the central lake in the urban area of Thu Thiem district as well as future Green spaces covering a large surface of the site. 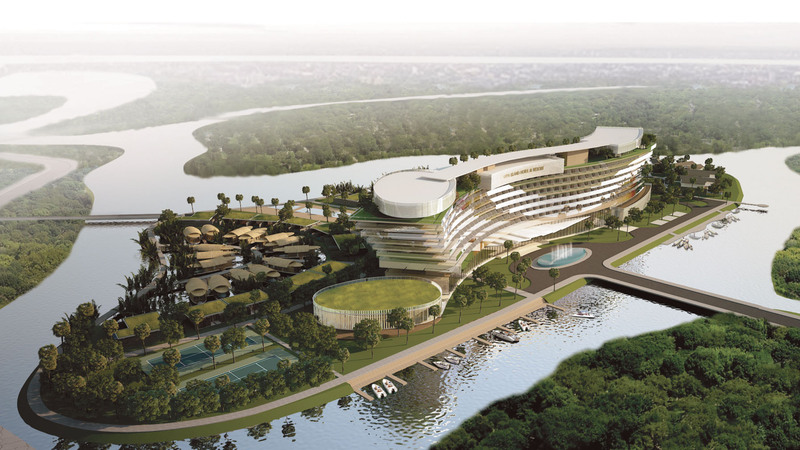 This landscape design will offer a 360 - degrees vista, surrounded by dear waters that reflect the natural beauty typical of South Vietnam. This future urban area calls for a distinctive and attractive architecture, in adequacy with the exceptional nature of the project. 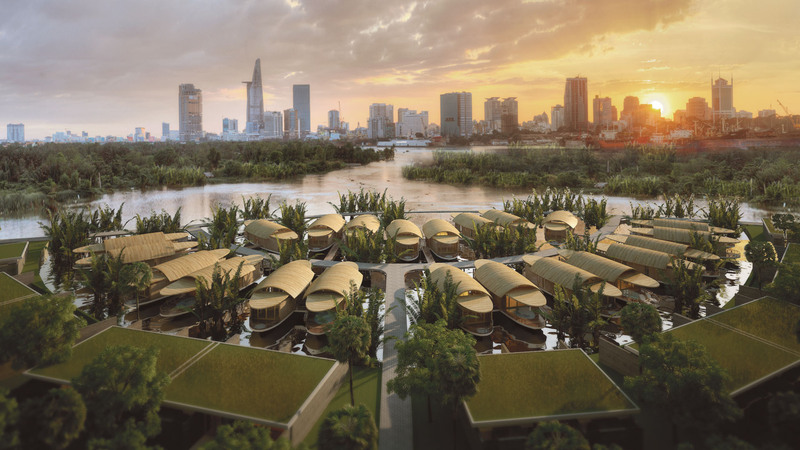 The location of the site gives it a particularly pleasant character for several reasons: its sunlight orientation quality, the presence of dominant winds following the southwest and southeast directions as well as proximity to the Saigon River and the central lake, allowing for efficient natural cooling to the area. The project is located at the frontier of Saigon and a strip of land acts as a peninsula to the east: Thu Thiem district. Moreover, the area is well - served by modem infrastructures, with the East-West Highway as well as the docks of Ben Du Thuyen located at the limit of Thu Thiem and Saigon River. These docks can receive various types of recreational boats of all sizes and will be segregated from the main industrial harbor area. A commercial area with shops, restaurant and residences will also be built. In accordance with the urban planning fo Thu Thiem by the public authority, the project will span along the north-south axis in a pattern of blocks with an architecture that reminds one of ship navigating along the river and canals of Southern of Vietnam. The project is composed of two parts. In the first, resort villas will be set up following the natural slopes of the site’s topographyin the second part, a 1 0-storey hotel will display an architecture with stylish froms reminiscent of a white luxurious ship sailing on the river--an idyllic vision emphasising the character and context of the natural landscape. The resort villas, the swimming pool and loafing market are peaceful and calm areas, offering views overlooking natural and luxurious vegetation. The hotel towers are located in an emphatic position and offers a panoramic view with the city center in the background. The architectural image of the project is based on Vietnamese bungalows, putting forth the distinctive Southern architectural style.. Furthermore, by proposing a flora landscape composed of coconut trees, hyacinth, reeds and palm trees, the project will awaken the curiosity of visitors and foreign tourists.